Why Should Eggs Be Stored Pointy End Down? You’ve probably heard that eggs should be stored with the pointy end facing downwards, but often wondered why? Or maybe you’ve not ever heard that and you’re reading it here for the first time. Either way, it’s the truth. Eggs should be stored pointed end down. But why? Well, I’ll explain it to you. Continue reading Why Should Eggs Be Stored Pointy End Down? 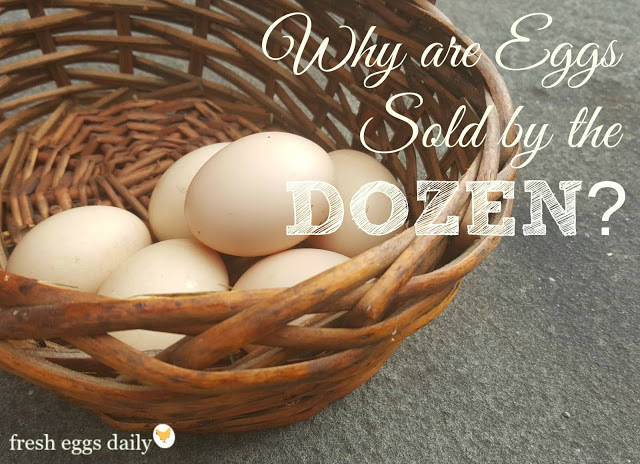 A Dozen Eggs – Why Are They Sold In A Dozen? The number twelve has had special significance for man since the ancient times, from Jesus’ twelve apostles to twelve full moons per year and twelve months in a year. There are twelve inches in a foot and twelve hourly divisions on a clock. There are twelve zodiac signs, twelve tribes of Israel and twelve Knights of the Round Table. There are twelve days of Christmas. But what does any of that have to do with why eggs are sold by the dozen? Continue reading A Dozen Eggs – Why Are They Sold In A Dozen? 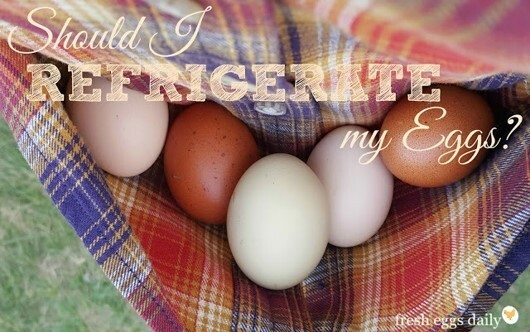 Continue reading Should I REFRIGERATE My Eggs? So if you want to be guaranteed blue egg layers, you will want to raise some Araucanas or Ameraucanas; but Easter Eggers are fun because you never know what color egg each will lay until she starts laying, and even identical-looking hens often lay varying shades of bluish or greenish eggs. Only about one in every thousand eggs is double-yolked, meaning that there are two yolks encased in the same shell. Since commercially-sold eggs in the United States are candled prior to packaging and cartoned by weight, any double-yolkers are discarded and never end up on a grocery store shelf, so you could go an entire lifetime eating store bought eggs and never encounter one. But once you start raising your own backyard flock, chances are you’ll collect your share. But what causes them? A double-yolked egg occurs when a hen’s ovary is over stimulated and she releases a second yolk too early. Usually about an hour after an egg is laid, the next yolk is released, but if another yolk is sent down the oviduct too soon, a shell will form around both yolks and result in a single egg. 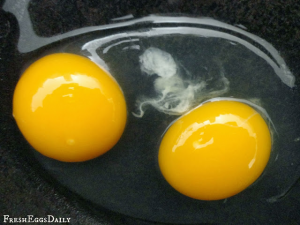 As a result, a double yolk egg is usually much larger than a regular egg. It’s far more common to find double-yolked eggs from new layers or older hens near the end of their laying life. It can be genetic, and therefore hereditary, and is more common in the hybrids and heavier breeds. Hens who lay large or double-yolked eggs are more prone to becoming egg bound or suffering vent prolapse, both potentially fatal afflictions. Double-yolked eggs generally won’t hatch if incubated, and if they do, it’s rare for both chicks to survive. Eggs are nutritious and an inexpensive protein source. You probably eat them several times a week without a second thought. But did you ever wonder what exactly is inside that eggshell? An egg is comprised of several components including the bloom, the shell, the membrane, the white, and the yolk, but that’s just the basics – blood spots, chalazae and bulls’ eyes may also be present. As the last step in the laying process, a thin nearly invisible layer is applied to the eggshell called the ‘bloom’ (sometimes also called the ‘cuticle’). This covering seals the shell to help protect the egg from air and bacteria entering through the tiny pores in the eggshell and also reduces the moisture loss from the egg. Eggs should not be washed until just before using to help preserve the bloom and to help keep the egg fresh. Just under the eggshell is a pair of thin whitish membranes that help to keep air out of the egg. Once an egg is laid, an air pocket begins to form between the two membranes at the blunt end of the egg. This air sac will continue to grow as the egg ages. Older hard-boiled eggs peel more easily because the air between the membranes has begun to separate the egg contents from the shell. The shell is the hard outer covering of the egg and is the egg’s best line of defense against contamination from bacteria and germs. The shell is mostly made of calcium carbonate, with small amounts of magnesium carbonate, calcium phosphate and protein. All egg shells start out white and then blue and/or brown pigment is applied during the laying process. 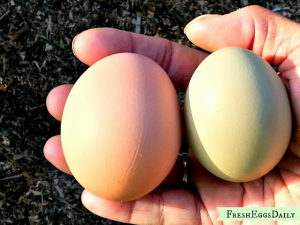 The blue is applied earlier (in breeds who carry the blue gene) and does seep through to the inside of the shell, but if you notice, the inside of a brown eggshell is always white. All eggs taste the same and contain virtually the same nutrients regardless of shell color. The egg white, or albumen contains 60% of the protein in an egg, which is about 10% of the USRDA. Eggs are considered a complete protein because they contain all eight essential amino acids. The white of a fresh egg will be cloudy and very thick. 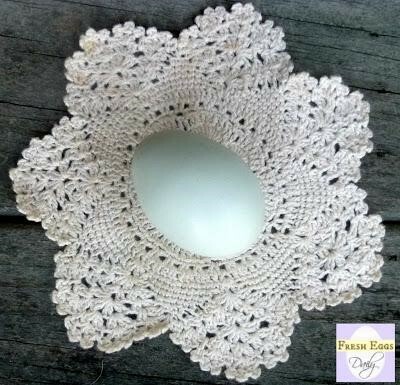 As the egg ages, the white will become nearly transparent and thin as air flows through the pores in the eggshell. The egg yolk contains about 80% of the total calories and virtually all of the fat and cholesterol in the egg, along with the majority of the vitamins and minerals. The color of the yolk is determined by the level of xyanthophyll in the foods a hen eats. Xyanthophyll is a carotenoid found in marigold petals, corn, alfalfa, basil and other foods. The chalazae are ropy, twisted strands in the egg white that anchor the yolk in place in the center of the white. They are more prominent in fresh eggs and perfectly edible. Red blood (or meat) spots on an egg yolk is not an indication of fertility, but are ruptured blood vessels that have been damaged or broken during the laying process, during the travel down the oviduct, or by rough handling of the egg. As an egg ages, the yolk absorbs water from the egg white. This dilutes the blood spot, so a spot indicates that the egg is fresh. The blood spots are edible, but you may want to remove them before cooking the egg. It is estimated that less than 1% of all eggs produced contain blood spots. If an egg has been fertilized, you will see a multi-ringed bull’s eye on the yolk that indicates that the egg would likely hatch into a chick if incubated for 21 days under a hen or in an incubator. Fertilized eggs are perfectly edible and taste the same as non-fertilized eggs. The only difference is that they contain miniscule amounts of the male rooster’s DNA in addition to the hen’s DNA that all eggs contain. Considering that a chicken lays an egg every 26 hours or so, it’s no wonder that things sometimes go wrong. Occasionally, an egg will get stuck in a hen’s oviduct and she will become egg bound. Signs of an egg bound hen include sitting on the ground or dragging wings, fluffing up, lethargy and closed eyes. 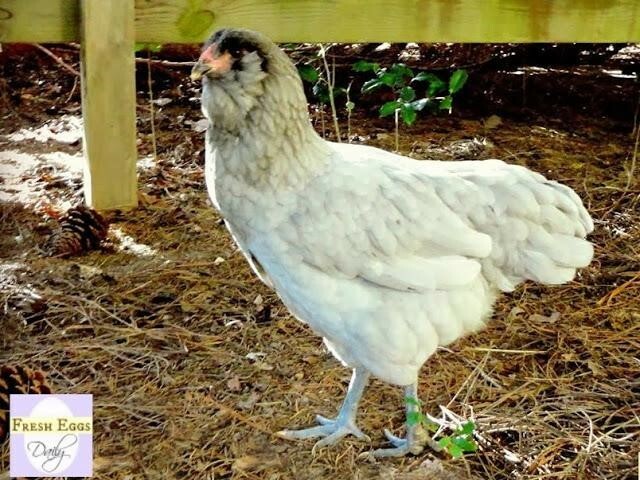 Frequently, an egg bound hen’s tail will be down and most likely she will be straining or pumping her backside. Upon closer examination you may notice liquid dripping from her vent. You may even be able to feel an egg-shaped lump. Causes of Egg Binding – More common in young pullets, egg binding could be due to a large or double yolked egg that is too large to pass through, genetics, stress, dehydration, internal worms, low-quality feed, poor health or a calcium deficiency. Calcium is needed for proper muscle contraction. Too much protein in a hen’s diet can also cause egg binding. You want to handle your egg bound hen carefully to avoid breaking the egg inside her. A broken egg can become infected and lead to peritonitis, which is caused by egg material stuck inside the hen and must be treated immediately with an antibiotic and probiotic powder to build up her good bacteria. Even if the egg is not broken, the condition must be treated quickly. An egg bound hen will die if she is not able to pass the egg within 48 hours, so once you have made your diagnosis, treatment should start immediately. Treatment for Egg Binding – Bring the hen into the house and soak her in a plastic tub in your bathtub. Submerge her lower body and vent in warm water with some Epsom salts for about 20 minutes, gently rubbing her abdomen. Remove her gently from the bath and towel dry her, blotting her feathers carefully, then blow dry her with a hair dryer set on low heat. Rub some vegetable oil around her vent and very gently massage her abdomen once more then put her in quiet, dark location – such as a large dog crate or cage. You want to create moist heat, so set the cage over a pan of hot water, put a heating pad and towel on the bottom of the crate or set up a heat lamp, then drape a towel over the cage. Give your egg bound hen an eyedropper of Nutri-Drench and 1cc of liquid calcium. Then give her some time to herself. Repeat the soak in the tub every hour or so until she lays her egg. As a last resort, a visit to a vet is recommended or, if you can see the egg, you can try to carefully extract the contents of the egg using a syringe. Then you will need to gently crush the shell, keeping the fragments attached to the membrane and remove it using vegetable oil squirted in and around the vent. 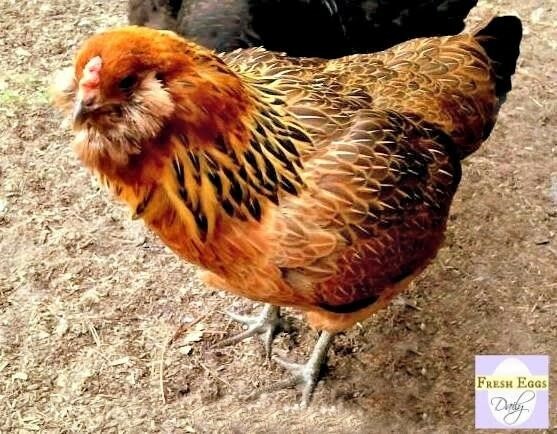 This is risky and carries with it the danger of your hen contracting peritonitis, so should ONLY be used after all other remedies have been tried. Fortunately, being egg bound is not all that common, and there’s a good chance you may never have a hen suffer from it, but it’s still good to know the signs and how to treat it. 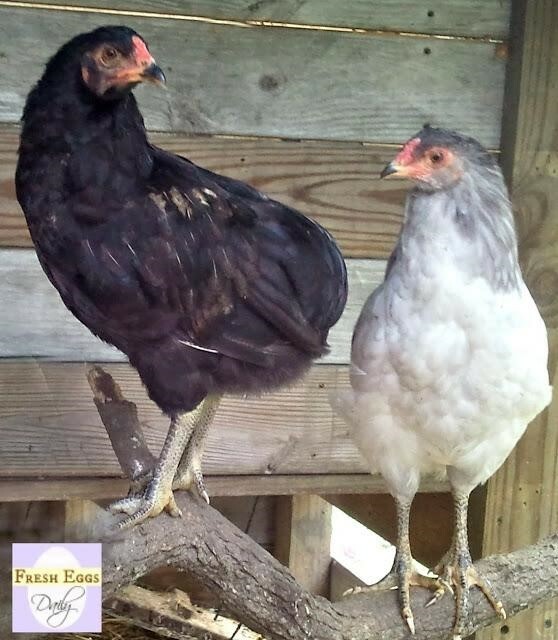 As many of you know, I enjoy adapting ideas I see online and elsewhere for the enjoyment of our chickens. I have seen several versions of birdseed wreaths for wild birds on Pinterest HERE, HERE and HERE and decided to make my own chicken version. My first two attempts didn’t work very well – don’t trust everything you read online! – and fell apart, but this, my third attempt turned out perfectly. Easy, quick, held together well and the chickens loved it! Here’s how to make one for your girls. Spray Bundt pan with cooking spray and set aside. In a measuring cup, dissolve the gelatin in the cool water and let sit for a minute. Pour the boiling water into a medium bowl and whisk in the gelatin to combine. In a large mixing bowl, combine the seeds and nuts, stir in the grease and then pour in the liquid gelatin. Mix well with a wooden spoon to be sure all the nuts and seeds are well-coated and all the liquid is absorbed. Place the cranberries in rows in the indentations in the pan (I used three in half the indentations and two in every other indentation) and then carefully spoon the seed mixture into the pan. Press down with the spoon to pack it well. Put the Bundt pan in the refrigerator overnight to set. The next day, take the wreath out of the refrigerator and let come to room temperature. Invert and tap gently on the countertop to unmold. Tie a pretty ribbon in a bow at the top and then attach the wreath to your run fencing for your chickens or to a tree or fence to treat the wild birds. I did switch out the fancy ribbon for a plain one when I hung the wreath in the run.